Robert D. Behn is a lecturer at Harvard University’s John F. Kennedy School of Government, and a passionate advocate for public sector performance. His regular Performance Leadership Report is always succinct and salient. His definition of performance management, versus performance measurement, clearly puts the responsibility on leadership’s shoulders. In his report What Performance Management Is and Is Not, Bob describes eight specific requirements of performance management in organisations. These eight requirements lend themselves as a framework for assessing the degree to which your organisation truly does manage performance. And with a bit more flesh on the bones of that framework, they become a recipe for the behaviours to nurture, practice and master to pursue performance excellence. I’ve repeated each of Bob’s performance management requirements, and added my own fleshing-out of the behaviours that, to me, are in need of most practice. 1) “Performance management” requires that members of the leadership team of a jurisdiction, agency or collaborative, to focus their efforts on achieving a specific public purpose. In my book, this means no weasel words. It means talking about results in a language that everyone can understand. It means dropping the assumption that broad and vague goals are necessary to create space for people to create their own meaning from them. They’re not, and they actually achieve the opposite. 2) “Performance management” requires the leadership team to focus everyone on the task of eliminating or mitigating one of the important performance deficits that is preventing them from achieving this purpose. The Franklin Covey Institute talks about how the more goals we have, the lower our chances of achieving them with excellence. It’s better to put our energy into talking about and acting on three or fewer results to improve at any one time. The sharper the focus, the faster and bigger the improvement. Too many strategic plans are complex and bloated and, incidentally, not at all strategic. A line must be drawn to separate the vital few results that must improve now, from the multitudes that should wait. 3) “Performance management” requires the leadership team to define a performance target – a specific result to be produced by a specific date that, when achieved, will eliminate (or at least mitigate) this key performance deficit. Well-designed targets are a powerful statement about making change happen. But too often people set the target without first having a well-designed performance measure for the specific result and performance deficit. The measure has to come first, before you can understand the deficit and set a sensible target. 4) “Performance management” requires the leadership team to develop a performance strategy that will engage employees, collaborators, and citizens in helping to achieve this target. Targets should never be set for individuals to achieve alone. No one person has that much control over organisational results. But working with others, collaborating to design and create a change together will often produce results behind each person’s wildest dreams. 5) “Performance management” requires the leadership team to track, regularly and frequently, data that reveal its progress toward achieving this target. 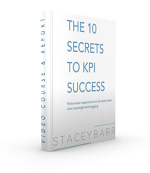 Performance measures should be monitored as frequently as makes sense. Monitoring them annually, to match the planning cycle, is too little and too late. When you monitor measures more frequently, you get feedback faster and can detect signals sooner. 6) “Performance management” requires the leadership team and staff to analyze this data to determine how much progress they are making towards achieving their target. 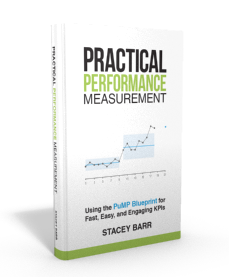 It’s almost a given that you should set a target for individual performance measure values, and compare the current month with the target to assess progress. Wrong! This ignores natural variability in performance, which exists for every single measure of performance. Using XmR charts solves this problem, and makes it a cinch to measure how far actual performance is from targeted performance. 7) “Performance management” requires the leadership team to learn from this data – use its analysis of its data to make adjustments (or drastic revisions) to their strategy. Blame, passing the buck, and treating symptoms are behaviours too commonly in practice in how people approach performance improvement. The best kind of performance improvement is when we use our measures to guide us to improve or redesign our business processes. We need to make fundamental performance improvements, and not spend resources on compensating for unacceptable performance. 8) “Performance management” requires the leadership team – after it has achieved its target – to select another performance deficit and create another target plus another strategy for achieving this new target. This is the philosophy of continuous improvement, the belief that standing still and avoiding change will only guarantee that we’ll go backwards. All evidence is in support of this philosophy being true for the way the world really works. What if the leadership team isn’t ready? Unless the leadership team is actively ensuring all these eight behaviours are being practiced and mastered, your organisation is not managing performance. But does it really have to start with the people in those leadership roles? 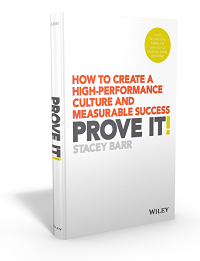 Do you have to wait for the leadership team to step up to the task? I don’t think so. Leaders are people too, and when people work in the same system, they can’t help but influence and learn from each other. What can you do, that can show your leaders and colleagues that measuring what matters is the most powerful path to making what matters happen? How have you influenced your leadership team to embrace the behaviours required of performance management?